There’s something I find wonderfully appealing about Victorian Era children’s book art (though, yes, technically speaking, this would be in the Edwardian period as it was published in 1902 … but Denslow was certainly famous for his work during the Victorian period). There’s a great deal of whimsical fantasy, the sense that anything is possible, and yet it is anything but cuddly. In fact it is often a little eerie or creepy. But of all the versions of this poem that I have on my shelves (and there are more than a few of them), this may be my favorite. I am particularly fond of the little eerie faces throughout. The brass andiron’s in the fireplace have expressive faces, as does the clock on the mantle. And who doesn’t find the face in the Christmas tree to be just a tad frightening. Or that of the face in the moon? Denslow gives a nod to Wizard of Oz with the inclusion of a Tin Woodsman doll in Santa’s sack. Be warned…this is from 1902 and there are some politically incorrect figures here, including an Al Jolson-like black-face doll. I really like this edition and am grateful to Dover Publications for re-issuing it. I hope they will consider publishing some of Denslow’s other works as well. Looking for a good book? 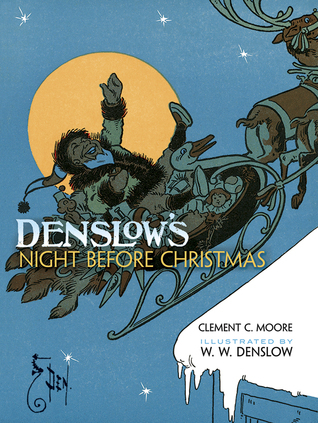 Denslow’s Night Before Christmas in a beautiful example of story-telling art from the late Victorian Era/turn-of-the-century and is still enjoyable today.